How can the Prophet Muhammad be a prophet if he has no prophecy? Mecca, also spelled Makkah (in full Arabic: Makkat Al Mukarramah) is a city in Saudi Arabia, regarded as the holiest meeting place in Islam. Muslims are required by Allah (their false god) to make a pilgrimage to Mecca at least once in their life (unless too poor to do so). Mecca is so idolized by Islamic Muslims that they are taught not to face Mecca while using the restroom. They are also taught that they'll go to Hell if they urinate on themselves. I used to work with a Muslim who took a water bottle to the bathroom each time to cleanse himself. This is taught in their religious book, The Hadith (a collection of narrations concerning the words and deeds of the Islamic prophet Muhammad). The two main denominations of Islam, the Shiites and Sunnis, have different sets of Hadith collections. The man I mentioned tossed down his carpet and faced Mecca 5 times daily to pray to his false god, Allah. Muslims pray in synchronization with the cycles of the moon; hence, it is known as the “moon god” religion since they idolize the moon. This explains why Islam is represented by the crescent moon shape. Before the 7th century Islam didn't exist. Before the false prophet Muhammad there was no Islam, no Allah, no Muslim religion. Wake up if you're a follower of this false cult. Islam is of the Devil. Many false religions are subtle and require a more thorough knowledge of the Scriptures in order to expose, such as the Seventh Day Adventists. They are a damnable religion, saturated with false doctrines and a false gospel of a works-based salvation; but if you didn't know any better you would easily be deceived since they do believe that Jesus is the Christ. 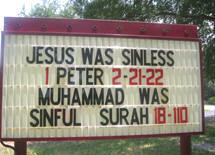 However, Islam is much more easier to expose, because they openly reject Jesus as the Christ, the Son of God altogether. According to the Quran, Islam's bible, God has no son. The Quran teaches that Jesus was kidnapped and someone else crucified in His place. In sharp contrast to the lies of Islam and Muhammad, 1st John 2:22 states, “Who is a liar but he that denieth that Jesus is the Christ? He is antichrist, that denieth the Father and the Son.” If you follow Allah, then you are the enemy of the God of the Bible. A popular lie that we hear nowadays, including from George W. Bush when he was U.S. President (2000-2008), is that Muslims and Christians worship the SAME GOD. The Bible and the Quran (Koran) are diametrically opposed to each other. There is NO harmony. Either God has a Son or he (Allah) doesn't. It cannot be both ways. Truth is reality, and there can only be one absolute truth in this matter. Allah has no son; the God of the Bible DOES have a Son. You'd be a total fool to follow Islam, because there is NO evidences or proofs of the validity of the Quran. Whereas the Bible contains much prophecy; the Quran contains no prophecy at all. Whereas the Bible was written by 40 different men (inspired by God), during a 1,500-year time span, from all languages and walks of life; the Quran was authored by ONE man, Muhammad. From reading the Quran, I realized very quickly that the Quran is a hateful manuscript against Christians and Jews. In sharp contrast, the Word of God teaches that God loves Jews and Gentiles alike; and Christ died for all, offering free salvation to all who come to the Father through the Son to be forgiven of their sins. Judaism, which is followed by most Jews today, is a satanic cult which also denies that Jesus is the Christ. The issue is not Jew against Arab (or vise versa). The Bible condemns all Christ-rejecters to eternity in the Lake of Fire, whether they be Jew or Gentile. Most Jews today reject Jesus as the Christ, just as do most Arabs. It is sad and tragic, and totally unnecessary. There is ONLY one way to Heaven, and that is through Jesus Christ. John 14:6, “Jesus saith unto him, I am the way, the truth, and the life: no man cometh unto the Father, but by me.” It's Jesus or Hell. God is no respecter of persons. a saved Arab will go to Heaven to enjoy the Lord's riches and blessings for all eternity; and an unsaved Jew will burn in the tormentuous fires of Hell for ever and ever. This is what the Word of God PROMISES! Consider yourself warned whoever you may be (2nd Thessalonians 1:8-9; Revelation 20:12-15). Jesus told Nicodemus (a ruler of the Jews) that no man can enter into the kingdom of God except he be born-again (John 3:3-7). That includes all Jews. God does NOT have a special covenant with the Jews concerning salvation as heretic John Hagee falsely teaches. The Mosaic law was only given that “ALL THE WORLD MAY BECOME GUILTY BEFORE GOD” (Romans 3:19, King James Bible). There can be no salvation through one's own self-righteousness, because we have NO self-righteousness to offer God (Isaiah 64:6). That's why Christ paid our sin debt, because we were hopelessly lost in our sins. Jesus paid a debt that He did not owe, because we owed a debt that we could not pay. Amen and amen! Oh listen friend, please don't be misled by Islam into thinking you can merit your way into Heaven. You cannot (Ephesians 2:8-9). The path to Mecca is a road to Hell. Mecca is not a holy city; it is just a city. There is no such being as Allah. Muslims deceitfully claim that “Allah” simply means god; but their god is not the true and living God of the Bible. The God of true Israel is the God of the universe; but He is not the God of most Jews today who reject their Messiah and King, the Lord Jesus. Muslims who believe on Jesus as the Christ are not coming to the God of the Jews; but to the God of Israel (and there is a big difference). Won't you come to Jesus Christ now?